In Lower School, we focus on establishing solid academic skills as well as fostering the personal growth of each child. A strong emphasis on reading, language arts, mathematics, and writing is enhanced by computer classes, hands-on science and social studies projects, exploration of the fine and performing arts, continued study of the Spanish language, and participation in physical education. It is in these early grades that exploration of the world sparks the students' love of learning and active participation in their own education. As they progress through Lower School, students begin to take responsibility for their own learning, actions, and belongings. A partnership of parent, student, and teacher allows children the opportunity to take risks and to challenge themselves in a supportive and safe environment. Performance and public speaking skills and comfort are developed throughout the Lower School years as students participate in concerts as well as presentations to their classes and to the entire Lower School about various topics of study. In addition, Lower School teachers nurture the children's growing awareness of the world outside of Gulf Stream and their sense of social responsibility. Each class spearheads at least one community service project. Whether they participating in a trike-a-thon to raise money for a children’s hospital, jumping rope for the American Heart Association, writing letters and sending care packages to U.S. soldiers overseas, or running the annual holiday food and toy drives, our students are learning about the responsibilities of belonging to a community. In the Lower School, we strive to provide each child with a strong reading and English foundation for a lifetime of learning and enjoyment. Readers' Workshop is used to teach children the skills needed to decode, comprehend, and appreciate various texts, both fiction and non-fiction. Phonics is the basic decoding technique and is reinforced by visual memory for irregular words. Reading, writing, listening, speaking, and thinking are integrated through the use of literature in a variety of genres, the children's journals, creative and expository writing, and class discussions. Language skills such as spelling, punctuation, capitalization, and correct English usage are taught through targeted instruction in workbooks, textbooks, and shared writing opportunities and as an integrated part of learning to write. There is also regular instruction in both cursive and manuscript handwriting. A variety of teaching methods, including large and small group instruction, independent work, and cooperative learning is employed. The Lower School math program is designed to inspire each child to succeed. Concept development begins with a concrete model and advances toward pictorial and abstract representations (standard algorithms). The curriculum emphasizes understanding over memorization although students are still expected to memorize basic math facts. The program makes the connection between the classroom and the real world, reducing gaps in learning and building confidence. 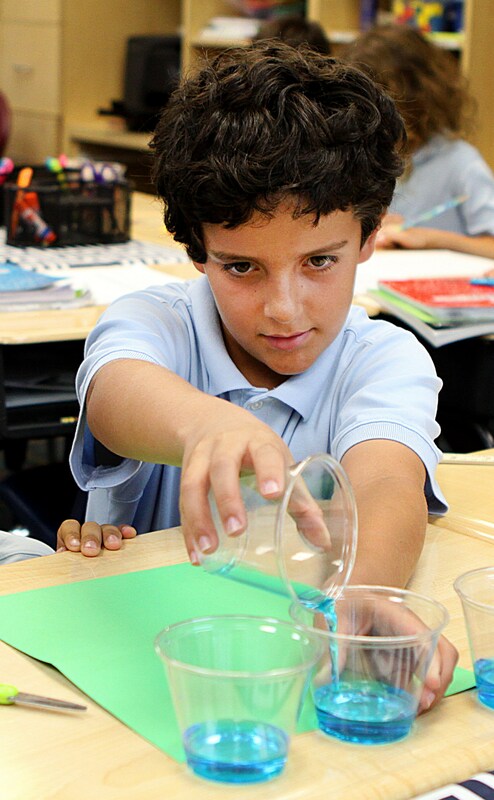 The Lower School math curriculum encourages perseverance and flexibility in problem-solving. Concepts are scaffolded and deepened each year preparing students for success in Middle School math. The Lower School social studies program is designed to give children an ever-expanding sense of the world around them. Tolerance for and appreciation of cultural, racial, religious, and ethnic differences are themes in every grade, as are current events, geography and map skills. Each spring, during our Children Around the World activities, each class studies a different topic and then presents what they have learned to the assembled Lower School. Much of the social studies instruction takes the form of teacher-led discussion and text reading, with more cooperative or collaborative work as the students progress through Lower School. In our Lower School science program, we use an active, hands-on, inquiry-based approach to learning in order to stimulate the children's natural inquisitiveness about the world. Classes meet twice a week in Grades One-Three and three times a week in Grade Four. Material is selected according to the skills, developmental level, and interests of the children as well as the importance of topics in our global community and our children's futures. To complement class work, students use our school environment which includes our field, playground, and butterfly garden. Field trips to nature preserves and science museums are part of the curriculum. The scientific method, its purpose, and its steps, is a focus throughout the science curriculum. The scientific skills of observation, prediction, measurement, estimation, and evaluation are practiced each year. Students are introduced to formal computer instruction in Lower School. The main objective of the program is to instill “technological awareness" through software programs, interactive tutorials, as well as the functionality of the Internet. All students are taught proper keyboarding skills using the online tutorial Edutyping.com. Students will quickly master software in order to create stories, charts, graphs, spread sheets and animated presentations. Nearly every computer enhanced project is designed to complement the curricula in academic courses. With the explosion of available information and online activities, the Internet has become a tremendous resource for all Lower Schoolers. They learn the function of a web browser, skillfully research topics, and participate in online activities. Students are introduced to coding by grade two and by grade 4 are designing and printing 3-D prototypes to solve real world problems. In addition to the Computer Lab, all Lower School classrooms are equipped iPads. These allow the students to work independently and enjoy a variety of educational programs, as well as providing another source of curriculum enhancement. Lower School Spanish classes meet twice a week for thirty minutes. The program stresses the development of vocabulary and accent, as well as knowledge and appreciation of other cultures. The focus on conversation, music, songs, dances, games, and visuals provides a multi-sensory approach to our foreign language study. Storybooks are used in the classroom and the response of the youngsters is lively. As they get older, students are introduced to basic reading and written work. They learn about sentence structure; they apply their Spanish skills to the study of articles and nouns as well as to both gender and quantity agreement. This early introduction to other cultures and languages nurtures the students’ burgeoning language skills. This serves them well when they reach Middle School where Latin is required in Grades Five and Six.